Willerby Aspen 40 X 13..........coming Soon! The Aspen two bedroom lodge is a two bedroom model in Sierra can excel cladding, this holiday home is pure luxury accommodation. It's thirteen feet width gives plenty of space internally. The holiday home will benefit from having central heating, double glazing, matching bedding sets and dishwasher. The Aspen also has microwave, fridge freezer, ample storage and wardrobe space. The furnishings are modern and attractive the kitchen is well laid out, spacious and with plenty of cupboards as well as being well equipped this making the kitchen a great space to spend some time. The lounge area has comfortable seating to include swivel arm chair and full height front window allowing the Devon sunshine to poor in. The second bedroom has larger than average twin beds and wardrobe. The master bedroom is well equipped, spacious and has a real opulence about it with plenty of wardrobes and its own shower room. There is also a second shower room off the hallway. The dining furniture is also free standing. 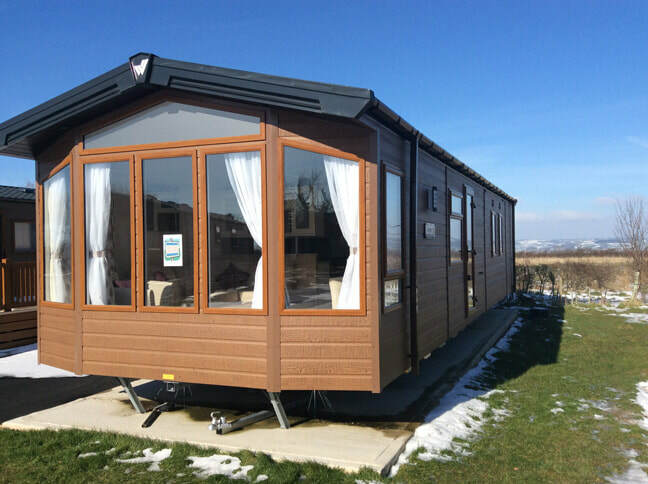 The price of this unit includes, delivery, connection, siting, caravan skirt, outside tap, outside electric point, digital arial and large side UPVC balcony in golden oak. This is a very luxurious holiday home that is full of great design ideas, it has an ease of use and is a real home from home.